Steve Tyree presented a talk to MARS (Marine Aquarist Roundtable of Sacramento) on Friday April 18th, 2008. Mr. Tyree is internationally known for his work relating to SPS species of corals and owns and operates Reeffarmers -a distribution site for captive farmed corals. Steve has been farming and distributing captive stony corals since 1993. Back then, the captive maintainance of reef building stony corals was still considered impossible by many. Today there are literally thousands of reef aquarist around the world that are not only maintaining these corals but they are successfully farming them. Over the years Steve has managed to acquire a large collection of rare and exotic corals. Steve showed photos of some amazing coral pieces from the best collectors in the US. Including Eric Caamano of Frag Farmers, Greg Carroll and John Dakaan of Your Reef in Roseville, CA. They all had some very unique and interesting names. Some of my favorites included Area 51, Pastel War and Peace, Blueberry Montipora, Strawberry Patch Montipora, Seasons Greetings Montipora, Red Hot Chili Pepper Digitata, Bazooka Joe Chalice, Bubble Gum Chalice and the Miami Hurricane Chalice. Sunday, May 11th, 2008, 10:30 AM to 4 PM, Hilton Newark/Fremont Hotel,39900 Balentine Dr., Newark, California 94560. From the Coral Farmers website: This 2008 Coral Farmers Market sanctioned event is the third annual event run by the Bay Area Coral Farmers Market company. Coral farming and exhibiting vendors will be selling or displaying their captive grown, cultured corals or reef related products to the public. We expect over 200 total attendees. Some of the best coral farming vendors from Southern California, the Bay Area, the states of Utah, Nevada and Arizona along with farmers from Sacramento will be setting up coral displays. Farmers include aquarists, retail reef shops, online coral shops and full scale coral farming enterprises. There will also be exhibitors present who will be demonstrating and selling their products. This SW-CFM event will also feature coral auctions, raffles and door prizes throughout the day. 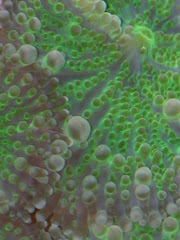 Reef aquarists new to the captive reef market can also expect to see a fine collection of easy to keep beginner corals. Aquarists and enthusiasts can attend this one-day event by purchasing a SouthWestern Coral Farmers Market day ticket online for ($15) up to one month prior to the event. Within 1 month of the event the online ticket price is ($25) per ticket. Tickets will also be sold at the door ($30) during the day of the event, but may be limited by occupancy restrictions. We are also encouraging our farmers to bring plently of farmed soft corals along with their usual excellent farmed stony corals. Steve's presentation can be downloaded here. Use the links on the left of the page. 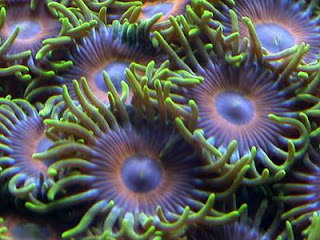 I recently read an article, Aquarium Science: Palytoxin and You: How and Why to Avoid a Deadly Zoanthid Toxin, Tropical Fish Hobbyist, and have noticed quite a few hits to my website in search of information on this nuisance chemical found zoanthid corals, which are in most reef aquariums. Although the title of the article includes the wording "deadly", I have yet to hear of anyone dying from exposure to palytoxin. I have a client in Zephyr Cove, NV that has many beautiful zoanthids. They have propagated quite a bit over the past three years and have taken over much of the rockwork. They look absolutely beautiful, but in turn, every two weeks after I service his aquarium I break out with a rash from the contact while cleaning his aquarium. Palytoxin is the most toxic natural product known, it is estimated that the lethal dose for a human is less than five micrograms. Supplies are extremely limited as it is only found at low concentrations in the corals that do contain it, although this may change if a microbial source is found. Although I have worn gloves, Coralife from Bayside Aquarium Supply (Marine Depot's wholesale division) while servicing aquariums, they are quite cumbersome and difficult to feel what I am touching while working. They are great to use when I receive a new case of live rock and I need to scrub off the decaying sponges and algae though. cream. Okay, so I picked this product up one time when I was in Baja. But I know that it is 1%, the same as what one of my client's, a Doctor, gave me after my first exposure to the toxin. I think that it is necessary to wear gloves in my line of work, but to be honest I haven't found the perfect pair. I have used these types of gloves, (photo off of an eBay ad) but they are a one time use and they only go up to my wrist. It is really important to be careful while hands are in your aquarium. There are many occupants that can irritate your skin. Including sponges, gorgonians, hydroids and euphylias. This is the final Podcast recording from the Marine Aquarium Expo and it's a good one! Bob Fenner is an excellent speaker. The MAX talk he presented was on reducing negative captive cnidarian interactions. What the heck is that you say? Listen and you will learn in an entertaining way. 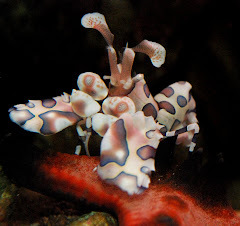 His bio from the MAX page; Robert (Bob) Fenner is a content provider to the pet-fish (ornamental) aquatics hobby and trade, dive/travel adventure and underwater natural history genres; writing, photography and videography. Though retired since 1994, he continues to produce in this field as well as consult on aquaculture and public aquarium installations. Bob has "lived" the science, hobby and business of aquatics in the Philippines, Japan and United States. All phases; collector, wholesale, jobber, retail, design, construction and maintenance. All levels; manager, owner, hatchery worker, retail clerk, technician. Except for a stint teaching high school sciences for four years, he has worked all his life in the field of ornamental aquatics. Academic experience includes fifteen years of college, a couple of life science degrees and a teaching credential for chemistry, physics and biology. 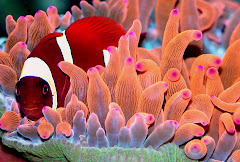 Published works include several studies on aquatic biological and chemical questions, and an extensive book and article publishing (helped author a few books, The Conscientious Marine Aquarist, Fishwatcher's Guide to the Tropical Marine Aquarium Fishes of the World, Natural Marine Aquariums Reef Invertebrates...) and photographic background in aquatic industry and hobby fields. Have taught High School sciences and Marine Sciences and Aquariology courses at the State University, University of California levels. To download his talk, click here and use the link on the left. Bob also runs Wet Web Media which contains a wealth of valuable information for the novice to the advance aquarist. Check it out! Marc Levenson, "Melev" on the web, gave an in depth talk on designing and building acrylic sumps. After his talk, I have a new found respect for the work that my acrylic fabricators do for me. From the Marine Aquarium Expo speaker bio page; My real name is Marc Levenson, but online I'm known to many as melev. I've been in the hobby for about 10 years and my Percula clownfish (the first fish I bought) is still with me to this day. I run a website called www.melevsreef.com that is there to help hobbyists everywhere. My site started off as a single page many years ago, talking about my 29g, but then grew longer and longer. It was like a never-ending blog, until one day I started page 2 about a new project for my tank - a sump. Over time, the site grew to include additional topics of interest such as acrylic work, photography, solutions to pests, information about my tanks, lighting, feeding, and more. There is always something new being added as time permits. Now entire sections are themed so that you can stay in a particular line of thinking. I've even begun the task of translating some popular pages into other languages to reach more individuals globally. I've been online for years, originally running a BBS called The Kingdom, run on an Atari STe back when high speed was a 2400 baud modem. That site was up for 7 years. More recently, I've been a part of a podcast for reefkeepers, www.reefcast.com which now has 25 different episodes available for download. Most of them are audio only in mp3 format but there are a few vidcasts mixed in for your viewing pleasure. We keep it casual, fun, and still cover a variety of topics to help you be successful reefkeepers. Ike Eigenbrode did a fantastic talk on electrical usage in a reef aquarium. He really broke it down and I walked away with the need to figure out exactly how much it costs to run my shop. From the MAX website; Ike Eigenbrode is currently the VP of Marketing at Current USA, Inc. of Vista, CA. A 17-year veteran in the aquarium industry, Ike has a B.S. degree in Biology from University of Central Florida and studied Aquaculture at the Florida Institute of Technology. While in college, Ike worked at a tropical fish hatchery as a fish pathologist worked extensively on a large scale marine fish and invert holding system. He has taught classes on numerous subjects including aquaculture system design, aquaponics and water quality monitoring systems. Ike is also an avid marine fish hobbyist and personally has a small scale coral fragging system. From the MAX speakers Bio: Michael Paletta has been keeping marine tanks since 1980 and reef tanks since 1985. During the past 20 years he has written over 180 articles on marine fish and invertebrates in both the US and Europe. His first book “The Modern Marine Aquarium” is an attempt to simplify marine fish keeping for the beginning hobbyist while at the same time incorporating advances that have been made due to reef keeping. This book has sold over 140,000 copies. His second book “Ultimate Marine Aquariums” illustrates how far the hobby has come in the past 15 years. In this book are examples of just about every type of reef tank using different methodologies and technology. Michael has enjoyed speaking at over 120 marine societies and national conferences in North America, Canada, South America and Europe. Michael has appeared on both local and national radio shows to discuss the hobby and to help new hobbyists become successful. 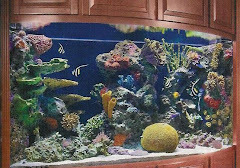 Currently Michael has 1,200 and 40- gallon reef tanks set up in his home. He has helped in the set up of over 200 tanks throughout the U.S, including several tanks over 4,000 gallons in capacity. Michael also acted as a consultant with the National Aquarium in Baltimore and the Pittsburgh Zoo Aquarium. Michael has B.S. from Dickinson College and a Master’s degree from Yale University. Michael has also been a technical consultant for several equipment manufacturers and online companies. Michael is currently employed in sales in the biotechnology field. Adam Blundell M.S. works in Marine Ecology, and in Pathology for the University of Utah. He is also Director of The Aquatic & Terrestrial Research Team, a group which utilizes research projects to bring together hobbyists and scientists. His vision is to see this type of collaboration lead to further advancements in aquarium husbandry. While not in the lab he is a presidency member for one of the Nation's largest hobbyist clubs, the Wasatch Marine Aquarium Society www.utahreefs.com. Adam has earned a BS in Marine Biology and an MS in the Natural Resource and Health fields. Adam can be found at adamblundell@hotmail.com. Or, click below to play. This is the first of six recordings from the Marine Aquarium Expo, Orange County Fair, this past weekend. The speakers for this conference were set up outside, near the children's touch pool and the Orange County Airport is not too far from the venue. So there is a bit of background noise, but I consider the recordings information worthy enough to post. I have started posting the length of my recordings in the titles from here on out. Jake's talk was 34 minutes, 37 seconds. This is Jake's bio taken from the MAX page. He spoke on the importance of flow in the aquarium. Jake Adams is a professional, practicing aquarist who has been an active participant in the national marine aquarium community for over 10 years. He has been educating aquarists of a wide range of marine aquarium topics through frequent articles, podcasts and presentations around the country. 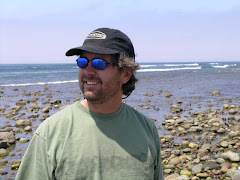 He recently founded www.coralidea.com which provides a free downloadable guide to coral identification for mobile devices and home computers. 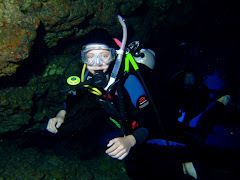 Jake has a Bachelor's Degree in Marine Science and he will be returning to graduate school to further pursue research in the field of coral reef ecology. Although aquarists may be developing a basic understanding on the properties of light, they are still very much in the dark when it comes to understanding water flow. 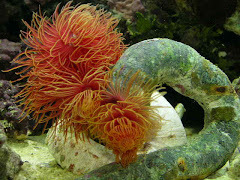 This presentation will review some of the science on the interaction of water flow and corals. 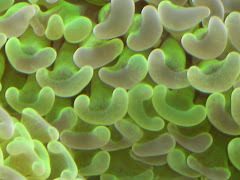 By applying the properties of moving fluids, it is possible to provide better and more relevant water flow for corals. By offering aquarists some background understanding of how water moves, I hope to encourage coral aquarists to re-evaluate water movement in their aquaria. I have downloaded Jake's Coral I.D. information and consider it a useful source. I would recommend any hobbyist with an Ipod, PDA or cell phone to download it and bring it along to your local fish store when you go coral shopping. To download, use this link and navigate on the left hand side of the archive.org page . To play, click the play button below.